All Khoisan languages but two are indigenous to southern Africa and belong to three language families. The Khoi family appears to have migrated to southern Africa not long before the Bantu expansion. Ethnically, their speakers are the Khoikhoi and the San (Bushmen). Two languages of east Africa, those of the Sandawe and Hadza, originally were also classified as Khoisan, although their speakers are ethnically neither Khoikhoi nor San. Most of the languages are endangered, and several are moribund or extinct. Most have no written record. The only widespread Khoisan language is Khoekhoe (or Nàmá) of Namibia, with a quarter of a million speakers; Sandawe in Tanzania is second in number with some 40–80,000, some monolingual; and the !Kung language of the northern Kalahari is spoken by some 16,000 or so people. Language use is quite strong among the 20,000 speakers of Naro, half of whom speak it as a second language. Khoisan languages are best known for their use of click consonants as phonemes. These are typically written with characters such as ǃ and ǂ. Clicks are quite versatile as consonants, as they involve two articulations of the tongue which can operate partially independently. Consequently, the languages with the greatest numbers of consonants in the world are Khoisan. The Juǀʼhoan language has 48 click consonants among nearly as many non-click consonants, strident and pharyngealised vowels, and four tones. The ǃXóõ and ǂHõã languages are even more complex. Grammatically, the southern Khoisan languages are generally analytic, having several inflectional morphemes, but not as many as the click languages of Tanzania. Khoisan was proposed as one of the four families of African languages in Joseph Greenberg's classification (1949–1954, revised in 1963). However, linguists who study Khoisan languages reject their unity, and the name "Khoisan" is used by them as a term of convenience without any implication of linguistic validity, much as "Papuan" and "Australian" are. It has been suggested that the similarities of the Tuu and Kxʼa families are due to a southern African Sprachbund rather than a genealogical relationship, whereas the Khoe (or perhaps Kwadi–Khoe) family is a more recent migrant to the area, and may be related to Sandawe in East Africa. Ernst Oswald Johannes Westphal is known for his early rejection of the Khoisan language family (Starostin 2003). Bonny Sands (1998) concluded that the family is not demonstrable with current evidence. Anthony Traill at first accepted Khoisan (Traill 1986), but by 1998 concluded that it could not be demonstrated with current data and methods, rejecting it as based on a single typological criterion: the presence of clicks. Dimmendaal (2008) summarized the general view with, "it has to be concluded that Greenberg's intuitions on the genetic unity of Khoisan could not be confirmed by subsequent research. Today, the few scholars working on these languages treat the three [southern groups] as independent language families that cannot or can no longer be shown to be genetically related" (p. 841). Starostin (2013) accepts a relationship between Sandawe and Khoi is plausible, as is one between Tuu and Kxʼa, but sees no indication of a relationship between Sandawe and Khoi on the one hand and Tuu and Kxʼa on the other, or between any of them and Hadza. Janina Brutt-Griffler claims, "given that such colonial borders were generally arbitrarily drawn, they grouped large numbers of ethnic groups that spoke many languages." She hypothesizes that this took place within efforts to prevent the spread of English during European colonization and prevent the entrance of the majority into the middle class. Anthony Traill noted the Khoisan languages' extreme variation. Despite their shared clicks, the Khoisan languages diverge significantly from each other. Traill demonstrated this linguistic diversity in the data presented in the below table. The first two columns include words from the two Khoisan language isolates, Sandawe and Hadza. The following three are languages from the Khoe family, the Kxʼa family, and the Tuu family, respectively. Proposed genealogical relationships between the Khoisan languages. Solid lines indicate well supported relationships, heavy dashed lines are conjectural, and light dashed and dotted lines have been rejected. The branches that were once considered ramifications of so-called Khoisan are now considered independent families, since it has not been demonstrated that they are related according to the standard comparative method. See Khoe languages for speculations on the linguistic history of the region. With about 800 speakers in Tanzania, Hadza is no longer seen as a Khoisan language and appears to be unrelated to any other language. Genetically, the Hadza people are unrelated to the Khoisan peoples of Southern Africa, and their closest relatives may be among the Pygmies of Central Africa. There is some indication that Sandawe (about 40,000 speakers in Tanzania) may be related to the Khoe family, such as a congruent pronominal system and some good Swadesh-list matches, but not enough to establish regular sound correspondences. Sandawe is not related to Hadza, despite their proximity. The Khoe family is both the most numerous and diverse family of Khoisan languages, with seven living languages and over a quarter million speakers. Although little Kwadi data is available, proto-Kwadi–Khoe reconstructions have been made for pronouns and some basic vocabulary. Khoekhoe This branch appears to have been affected by the Kxʼa–Tuu sprachbund. Tshu–Khwe (or Kalahari) Many of these languages have undergone partial click loss. A Haiǁom language is listed in most Khoisan references. A century ago the Haiǁom people spoke a Ju dialect, probably close to ǃKung, but they now speak a divergent dialect of Nama. Thus their language is variously said to be extinct or to have 18,000 speakers, to be Ju or to be Khoe. (Their numbers have been included under Nama above.) They are known as the Saa by the Nama, and this is the source of the word San. The Tuu family consists of two language clusters, which are related to each other at about the distance of Khoekhoe and Tshukhwe within Khoe. They are typologically very similar to the Kxʼa languages (below), but have not been demonstrated to be related to them genealogically (the similarities may be an areal feature). The Kxʼa family is a relatively distant relationship formally demonstrated in 2010. ǃKung (also ǃXun or Ju, formerly Northern Khoisan) is a dialect cluster. (~45,000 speakers.) Juǀʼhoan is the best-known dialect. Not all languages using clicks as phonemes are considered Khoisan. Most others are neighboring Bantu languages in southern Africa: the Nguni languages (Xhosa, Zulu, Swazi, Phuthi, and Northern Ndebele); Sotho; Yeyi in Botswana; and Mbukushu, Kwangali, and Gciriku in the Caprivi Strip. Clicks are spreading to a few additional neighboring languages. Of these languages, Xhosa, Zulu, Ndebele and Yeyi have intricate systems of click consonants; the others, despite the click in the name Gciriku, more rudimentary ones. There is also the South Cushitic language Dahalo in Kenya, which has dental clicks in a few score words, and an extinct and presumably artificial Australian ritual language called Damin, which had only nasal clicks. 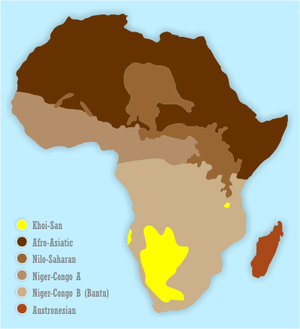 The Bantu languages adopted the use of clicks from neighboring, displaced, or absorbed Khoisan populations (or from other Bantu languages), often through intermarriage, while the Dahalo are thought to have retained clicks from an earlier language when they shifted to speaking a Cushitic language; if so, the pre-Dahalo language may have been something like Hadza or Sandawe. Damin is an invented ritual language, and has nothing to do with Khoisan. These are the only languages known to have clicks in normal vocabulary. Occasionally other languages are said[by whom?] to have "click" sounds. This is usually a misnomer for ejective consonants, which are found across much of the world, or is a reference to paralinguistic use of clicks such as English tsk! tsk! ^ a b Barnard, A. (1988) 'Kinship, language and production: a conjectural history of Khoisan social structure', Africa: Journal of the International African Institute 58 (1), 29–50. ^ a b Güldemann, Tom and Edward D. Elderkin (forthcoming) 'On external genealogical relationships of the Khoe family. Archived 2009-03-25 at the Wayback Machine' In Brenzinger, Matthias and Christa König (eds. ), Khoisan Languages and Linguistics: the Riezlern Symposium 2003. Quellen zur Khoisan-Forschung 17. Köln: Rüdiger Köppe. ^ Brutt-Griffler, Janina (2006). "Language endangerment, the construction of indigenous languages and world English". In Fishman, Joshua A. (ed.). 'Along the Routes to Power' Explorations of Empowerment through Language. Mouton de Gruyter. ^ a b Traill, Anthony. "Khoisan languages". Encyclopædia Britannica. Encyclopædia Britannica, inc. Retrieved June 10, 2017. ^ Güldemann, Tom; Vossen, Rainer (2000). "Khoisan". In Heine, Bernd; Nurse, Derek (eds.). African Languages: An Introduction. Cambridge: Cambridge University Press. pp. 99–122. ISBN 9780521666299 – via Google Books. ^ Tishkoff, S. A.; et al. (2007). "History of Click-Speaking Populations of Africa Inferred from mtDNA and Y Chromosome Genetic Variation". Molecular Biology and Evolution. 24 (10): 2180–2195. doi:10.1093/molbev/msm155.